It's about a week before the fifth anniversary of the start of the Iraq war And US lawmakers paused on Capitol Hill to remember those who have made the ultimate sacrifice. in Samarra, 96 km north of Baghdad, March 5, 2008. In a ceremony on Thursday, Democratic and Republican leaders thanked members of the military and vowed not to forget their service. John Boehner, House Republican Leader, said, "The life of every American soldier is a precious gift. You are the pride of America. A grateful nation says thanks. And we will never, ever forget." 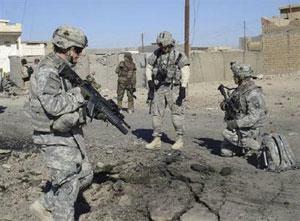 As lawmakers praised American troops, a group of veterans have gathered nearby in Washington to condemn the Iraq war. The group "Iraq Veterans Against the War" is holding an event, which began on Thursday called "Winter Soldier: Iraq and Afghanistan." Selena Coppa, Intelligence Sergeant, Active Duty Army Military, said, "I would stand up again and again to defend my country whenever and wherever and however it was required. The occupation of Iraq is not defending my country. It is not supporting the oath I swore. " During the four-day event, veterans are expected to describe their experiences serving in Iraq and Afghanistan. Violence escalates in Iraq despite US claim of "attacks drop"